Circuit design using microcontrollers is both a science and an art. This book covers it all. 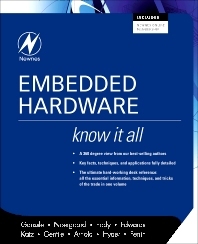 It details all of the essential theory and facts to help an engineer design a robust embedded system. Processors, memory, and the hot topic of interconnects (I/O) are completely covered. Our authors bring a wealth of experience and ideas; this is a must-own book for any embedded designer. As an engineering consultant, Fred Eady has implemented communications networks for the space program and designed hardware and firmware for the medical, retail and public utility industries. He currently writes a monthly embedded design column for a popular electronics enthusiast magazine. Fred also composes monthly articles for a popular robotics magazine. Fred has been dabbling in electronics for over 30 years. His embedded design expertise spans the spectrum and includes Intel’s 8748 and 8051 microcontrollers, the entire Microchip PIC microcontroller family and the Atmel AVR microcontrollers. Fred recently retired from his consulting work and is focused on writing magazine columns and embedded design books. Rick Gentile joined ADI in 2000 as a Senior DSP Applications Engineer, and he currently leads the Processor Applications Group, which is responsible for Blackfin, SHARC and TigerSHARC processors. Prior to joining ADI, Rick was a Member of the Technical Staff at MIT Lincoln Laboratory, where he designed several signal processors used in a wide range of radar sensors. He has authored dozens of articles and presented at multiple technical conferences. He received a B.S. in 1987 from the University of Massachusetts at Amherst and an M.S. in 1994 from Northeastern University, both in Electrical and Computer Engineering. Ken Arnold is the founder and former president of Paragon Engineering Services, Houston, Texas. He has more that 40 years of experience in the operations and project management. He is actively involved in production facility design. He has served on numerous SPE, API, and government advisory committees as an expert on oil handling, produced-water treating, and safety aspects producing operations.